Barry J. 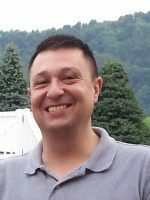 “BJ” Brugger, 38 of Wooster, passed away unexpectedly Monday, August 13, 2018. Born in Dover November 6, 1979, he was the son of Donald W. and Cheryl D. Ault Brugger of Strasburg, Ohio. A 1998 graduate of Garaway High School, BJ went on to further his education at Creighton University in Omaha, Nebraska, graduating in 2001 with a degree in Psychology. BJ had worked as a baker at Der Dutchman Restaurant in Walnut Creek and most recently worked at Chipotle in Wooster. In addition to his parents, BJ is survived by his brother, Adam J. Brugger of New Albany, Ohio; his sister, Sasha M. Brugger of Uniontown; and his brother, Devon J. Brugger of Blacklick, Ohio; aunts and uncles, Terry (Vicki) Brugger of Strasburg, Bruce (Cassie) Brugger of Wooster, Linda (Rich) Carter of Sugarcreek, Rodney Ault of Baltic; a special friend, Sandie Ullery of Wooster; numerous cousins; and his beloved cats, Timmy, Jimmy and Leo. He was preceded in death by his grandparents, Zane and Marlene Brugger and Russell and Darleen Ault; and an uncle, Rick Ault. The family will receive friends Friday, August 17, 2018 in the Geib Funeral Center at Dover from 11 AM to 1 PM where a memorial service celebrating BJ’s life will be held at 1 PM. Burial will follow in Ragersville Cemetery at Ragersville, Ohio.